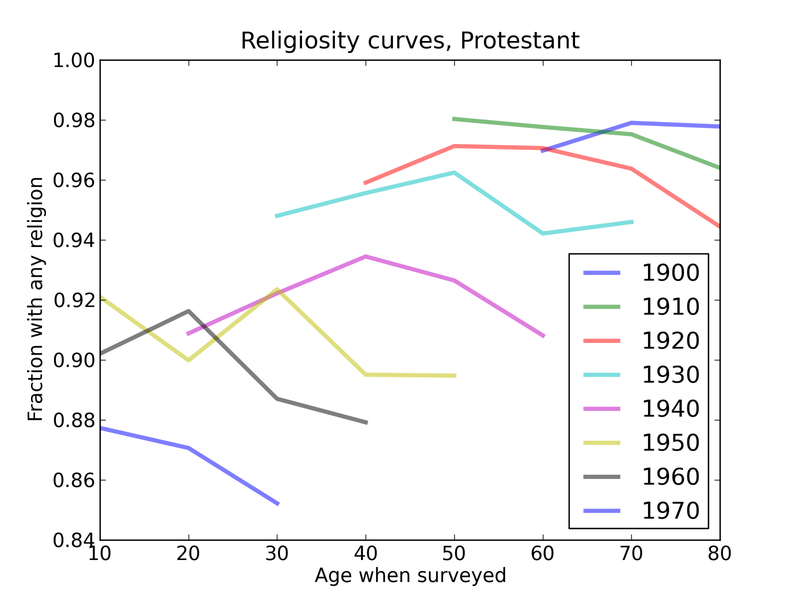 Based on 2000-2010 data from the General Social Survey (GSS), I present results of a logistic regression that measures the relationship between Internet use and religious affiliation, controlling for religious upbringing, income and socioeconomic index, year born (age), and education. 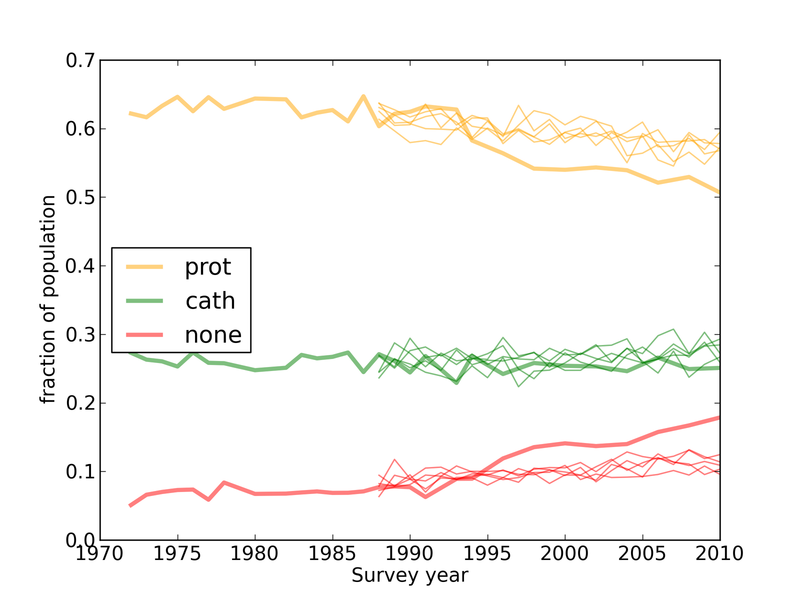 I find that moderate Internet use reduces the chance of religious affiliation by 2 percentage points (odds ratio 0.8); heavier Internet use reduces affiliation by an additional 5 percentage points (odds ratio 0.7). 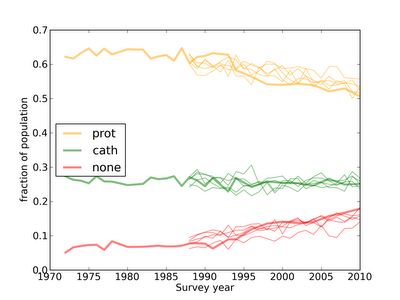 Four years of college reduces affiliation by an additional 2 percentage points (odds ratio 0.8). 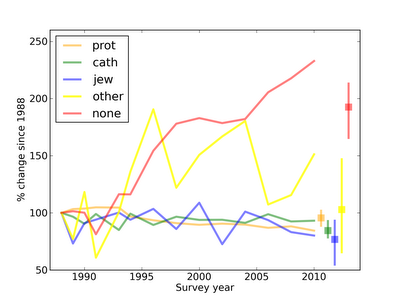 All reported effects are statistically significant with N=8960 respondents. 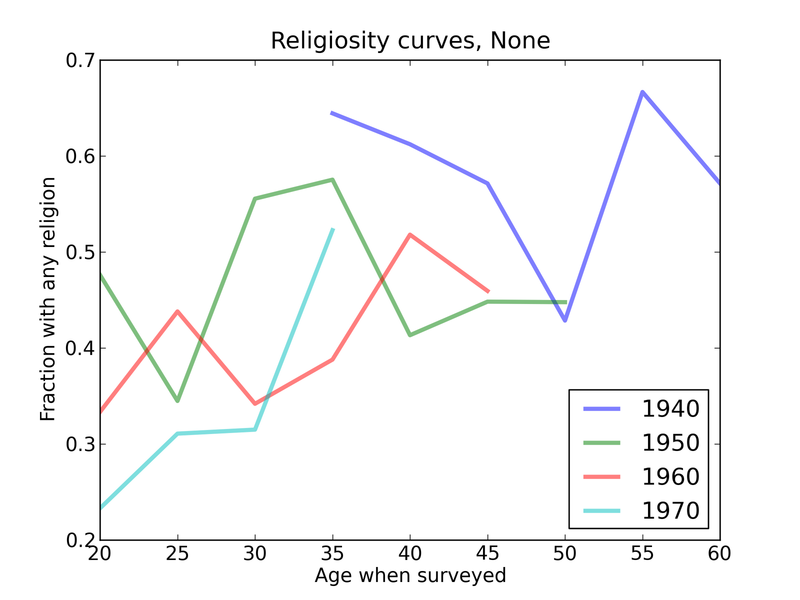 Start with a hypothetical baseline person raised in any religion, with moderate or high household income ($25,000 per year or more), born in 1960, with high school education but no college, and low Internet use (less than 2 hours per week): in the GSS survey, 91% of people in this category have a religious affiliation. Now we change one variable at a time. If this person were born 10 years later (in 1970) the fraction would drop to 89%. If this person used the Internet 2 or more hours per week, the fraction would drop to 85%. If this person used the Internet 8 or more hours per week, the fraction would drop to 80%. 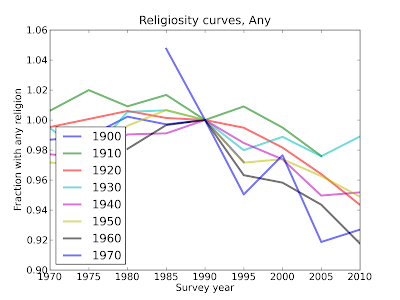 Taken together, college education and Internet use are associated with a decrease in religious affiliation of 9 percentage points. 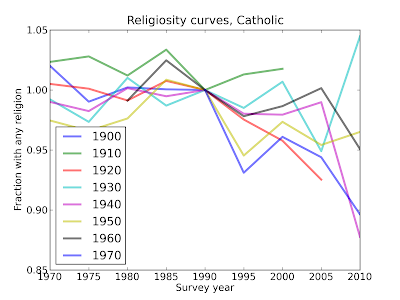 In a previous article I presented evidence that something happened in the 1990s, continuing through the 2000s, that is causing disaffiliation from religion across all generations, with the largest effect on the youngest generations in the survey, people born in the 1960s and 1970s. There are many possible explanations, but for me, the Internet pops to the top of this list. First, the timing is at least approximately right. 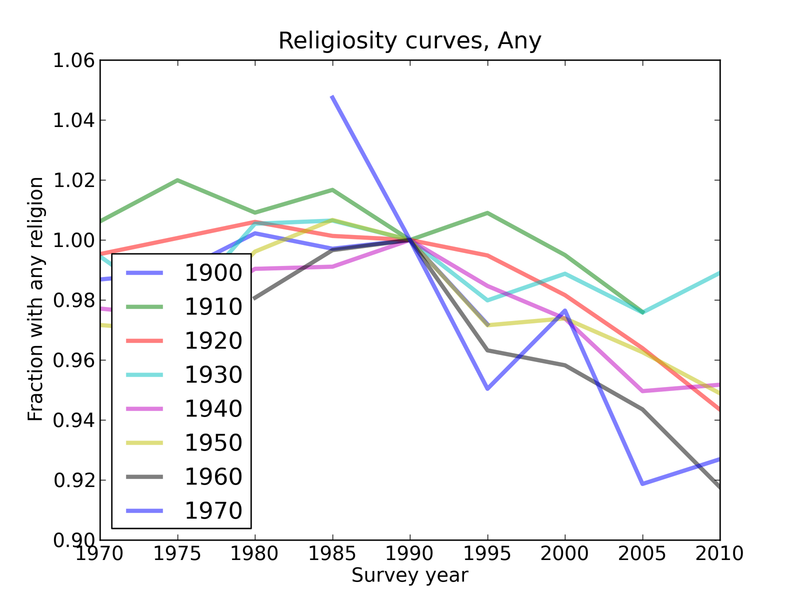 Here is data from the World Bank, showing number of Internet users per hundred people in the U.S.
Internet use increased rapidly from 1995 to 2010, which is the interval of steepest change in religious affiliation. born_from_1960: year the respondent was born minus 1960 (based on AGE and survey year). 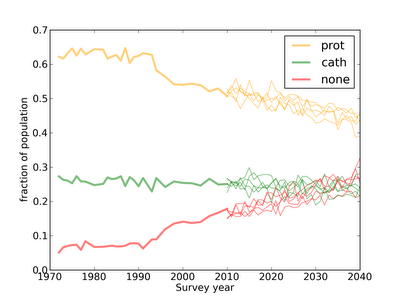 Subtracting 1960 makes it easier to interpret the results of the regression. educ_from_12: number of years of school completed, minus 12 (based on EDUC). SEI: Socioeconomic index (a measure of occupational prestige developed by the GSS). high_income: 1 if the respondent reports annual household income of $25,000 or more, which includes 62% of respondents who answered the question. 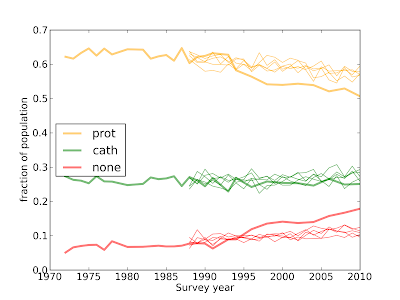 I used data from GSS survey years 2000, 2002, 2004, 2006, and 2010 (the relevant questions were not asked in 2008). I excluded respondents who were not asked or did not answer one or more of the questions I used in my analysis. It turns out that SEI does not make a contribution that is either statistically or practically significant, so I omit it from the model. (Intercept) -0.164434 0.094978 -1.731 0.0834 . 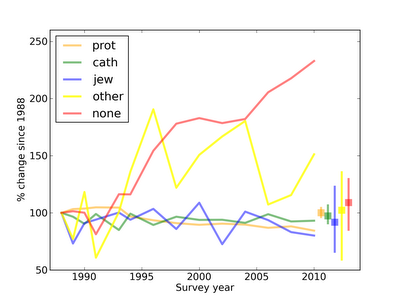 All explanatory variables are statistically significant: high_income and somewww are borderline, both at p=0.02. 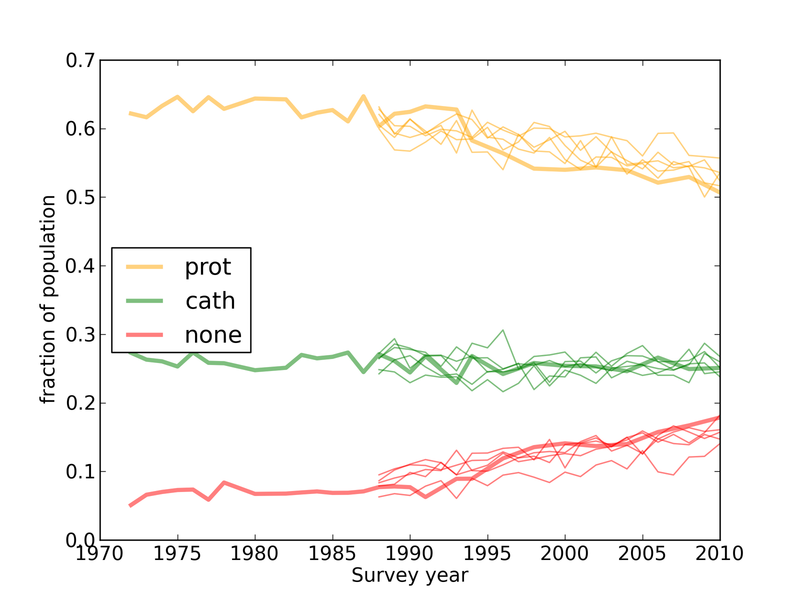 These results are summarized and interpreted in the Abstract, above. 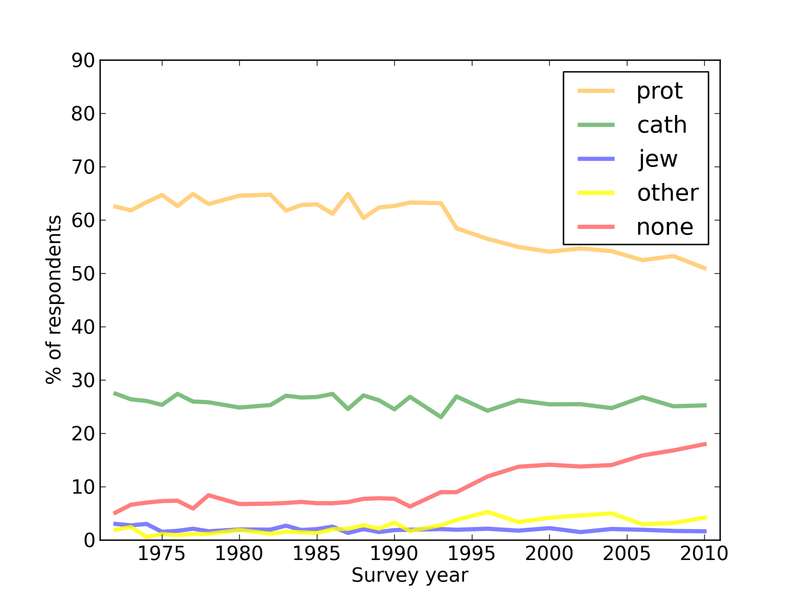 It is easy to imagine how Internet use could allow a person in a homogeneous community to find information about people of other religions (and none), and to interact with them personally. And there is anecdotal evidence that those interactions contribute to religious disaffiliation (for example, numerous personal reports on reddit.com/r/atheism). Conversely it is harder to imagine plausible reasons why disaffiliation might cause increased Internet use (except possibly on Sunday mornings). 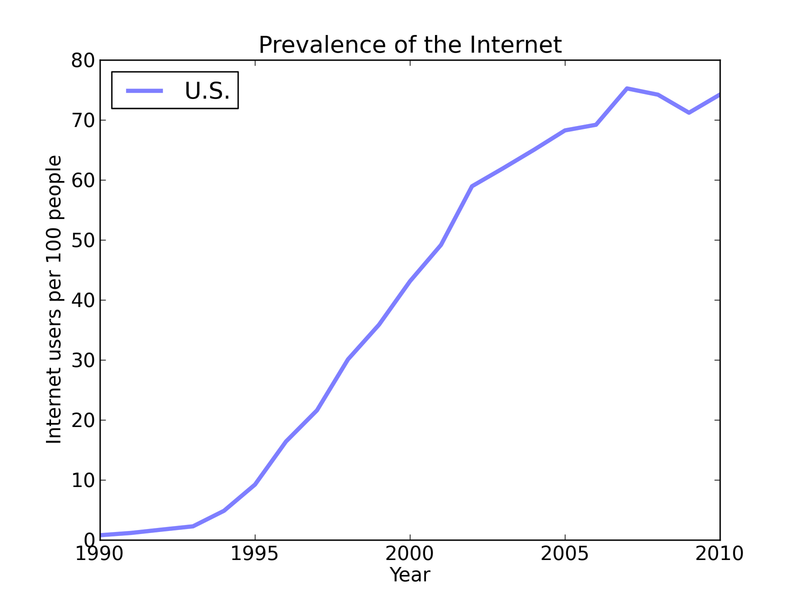 Although it is possible that a third factor causes both disaffiliation and Internet use, that factor would also have to be new, coincidentally rising in prevalence, like the Internet, during the 1990s and 2000s. 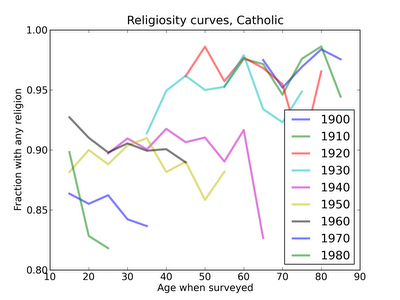 Whatever causes disaffiliation has the strongest effect on the youngest generations, which is consistent with the hypothesis that Internet use during adolescence and young adulthood has the strongest effect on religious affiliation. So with appropriate caution, I think there is a strong case here for causation, and not just statistical association. 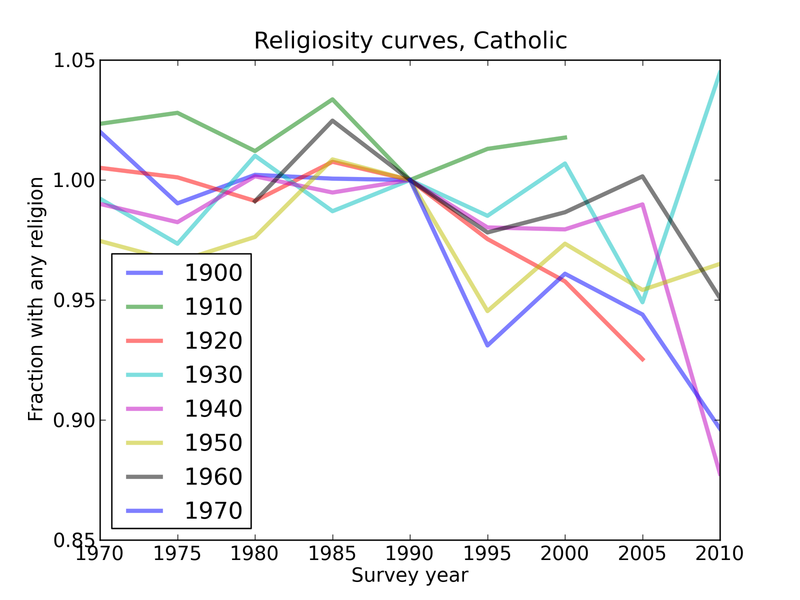 Furthermore, the magnitude of the effect is large enough to explain a substantial part of the observed changes in religious affiliation. 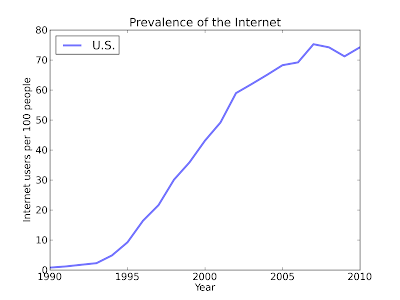 In my next article I will incorporate this regression model into the generational model I presented in Part Six, in order to estimate the effect of Internet use on these trends. In Part Six I presented a generational model that retroactively "predicts" the changes we have seen since 1988, and used it to predict how those changes are likely to continue in the next 30 years. 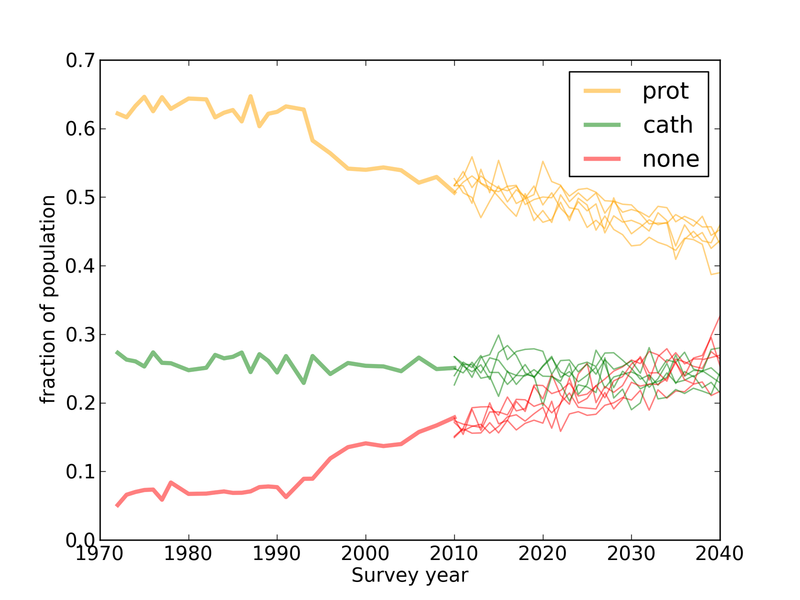 I expect the fraction of Protestants to continue to decrease, and the fraction of Nones to increase and overtake Catholic as the second-largest affiliation by 2030. 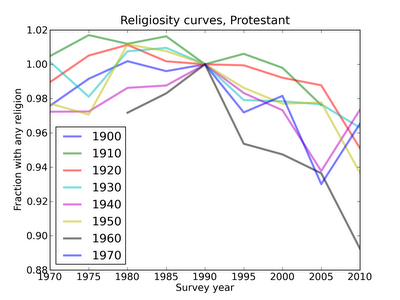 In Part Four I looked at changes in religiosity over the lifetime of respondents. The GSS is not a longitudinal survey, so we can't follow individuals, but we can follow generations (which I partition by decade of birth) over time. 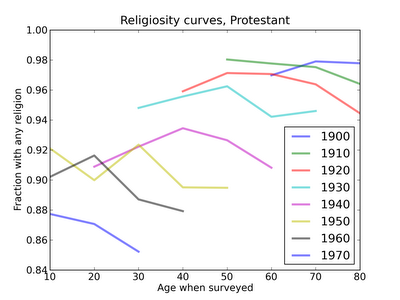 Each line represents a different generation. 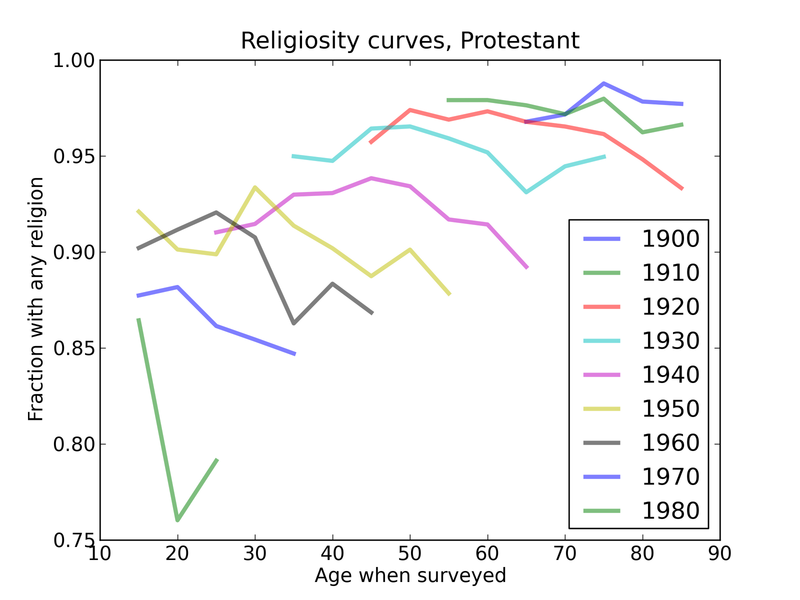 For example, the red line shows that people born in the 1920s were about 96% likely to report a religious preference when they were interviewed in their 40s, 50s, and 60s, and possibly less likely to be religious when they were in their 80s. 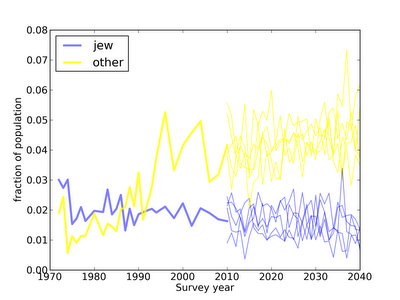 The conclusion I drew from this figure is that the differences between generations are larger than the changes, over time, within each generation. 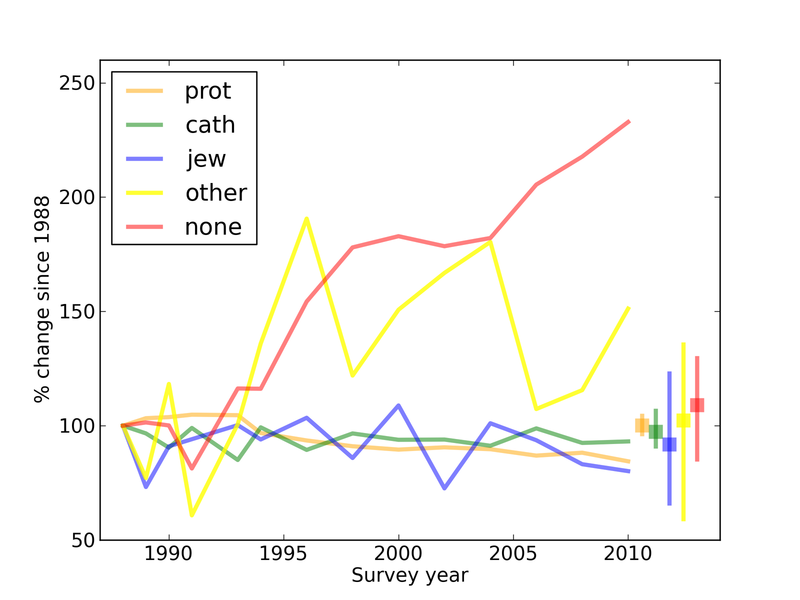 For purposes of modeling I concluded that religious disaffiliation accounts for only a small part of the observed changes in religious identity. 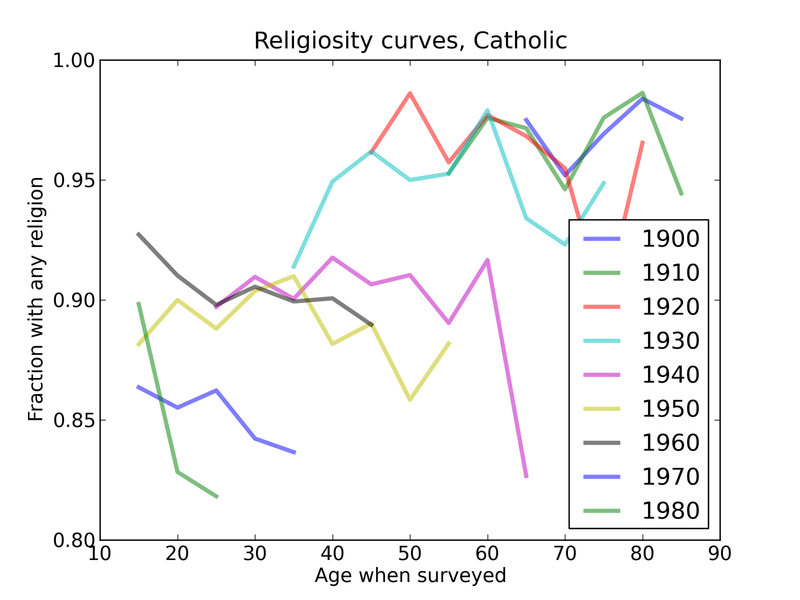 But I was bothered by one feature of these curves: many of them are concave down, and the maximum point in the curves is apparently shifting toward younger ages. I came to suspect that this picture of the data is "out of focus". 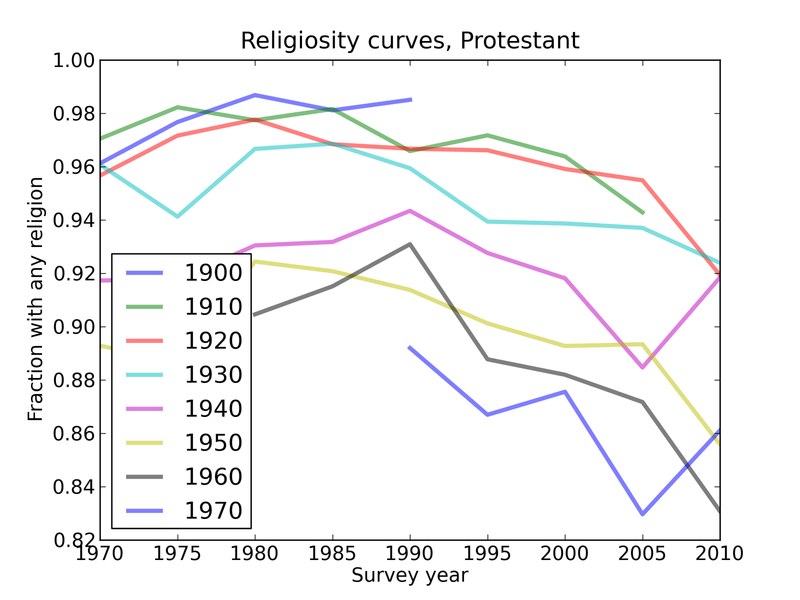 In this figure, two trends are more apparent: before 1990, most generations were becoming more religious; after 1990, they all became less religious. So it seems clear that the explanation is something that affected all generations at a particular interval in time, not something that affects all people as they age. 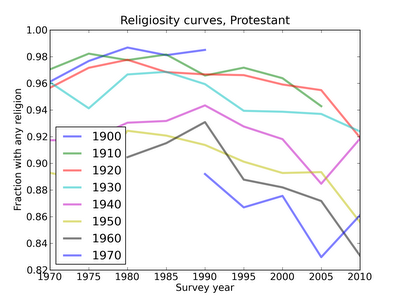 Again, most generation were becoming more religious before 1990; after 1990, all of them became less religious. 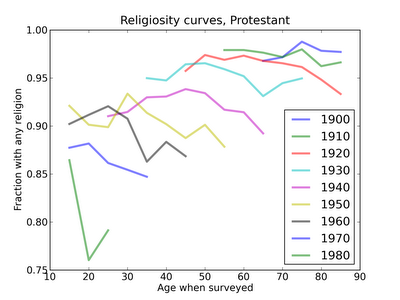 Among people born in the 1960s, more than 10% lost their religion between 1990 and 2010 (when they were in their 30s and 40s). 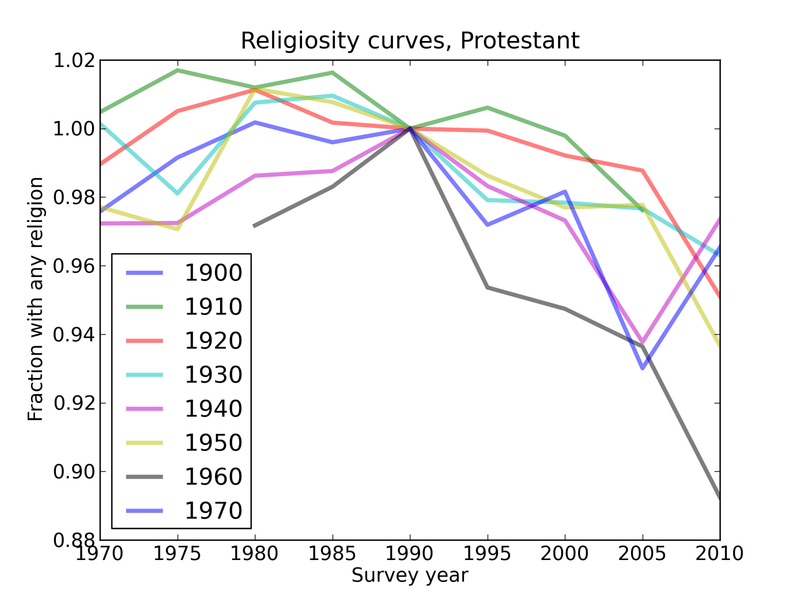 The general shape is the same: religious affiliation was flat or increasing prior to 1990, and decreasing for almost all generations after 1990. 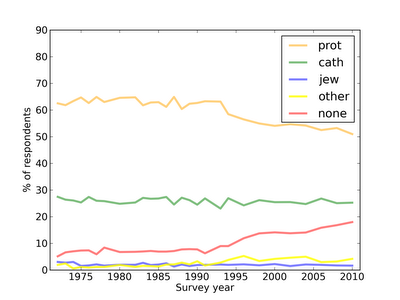 Since the trends are similar for Catholics and Protestants, we can get a less noisy picture by combining them. 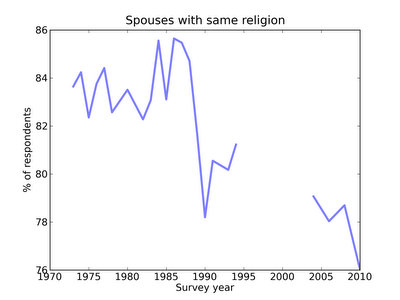 Here is the same graph for respondents raised with any religion. 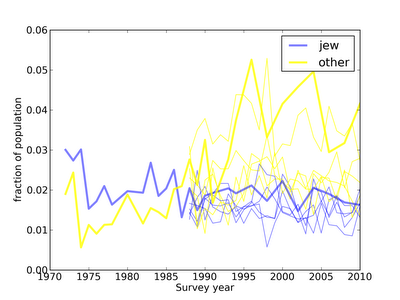 This figures makes it easier to compare across generations. It appears that more recent generations (born in the 1960s and 1970s) are disaffiliating at higher rates than earlier generations. All right, it's audience participation time. 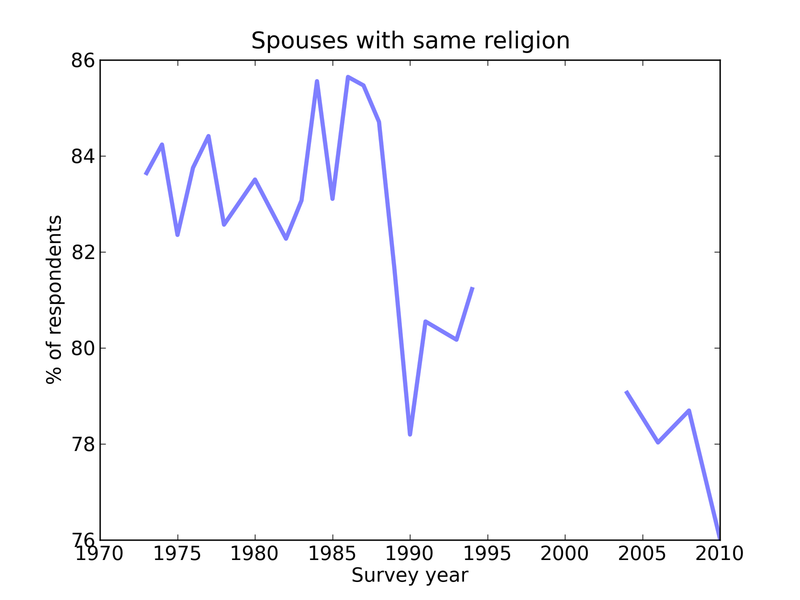 What happened in the 1990s that caused widespread religious disaffiliation? Remember, idle speculations only. No evidence, please!